6789 111/325 More year Minister gift book in the blue cover with on face inscription \"German Federal Postal Administration and posthorn\". 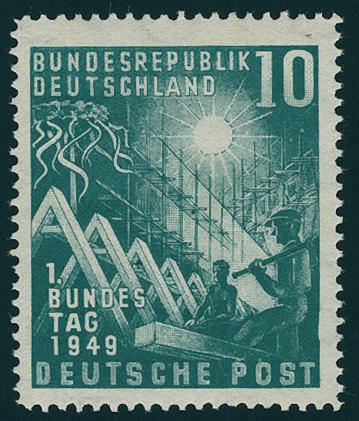 Included are all appeared special- and welfare stamps on 61 sides including Lower House of German Parliament 1949, 100 years stamps, Stephan, all sets helper of human resources, St. MaryÂ´s Church and so on. 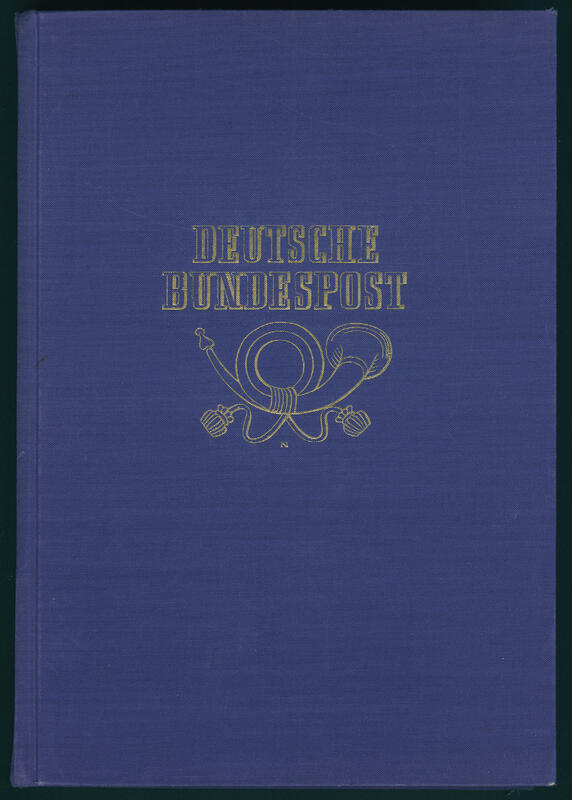 This scarce gift book was on the occasion of of the ten years existence of the Federal Republic of Germany presented from Federal Minister Stücklen. Very decorative and rare! 6790 111IV 10 Pfg. 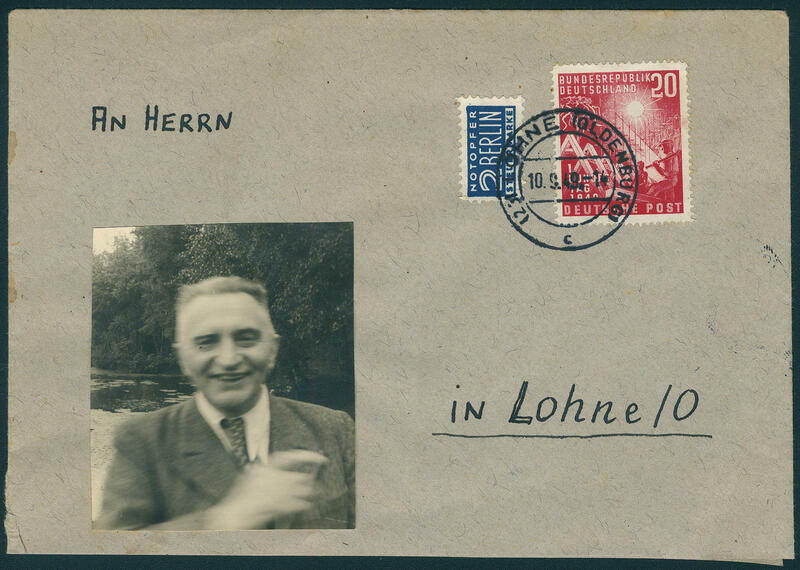 Lower House of German Parliament 1949 with plate flaw \"dot right in the O from post, DELLE at the bottom in the right picture edge\" from position 4, minimal red little dots on of the gum, otherwise in perfect condition mint never hinged Michel 450,- €. 6791 112 20 Pfg. 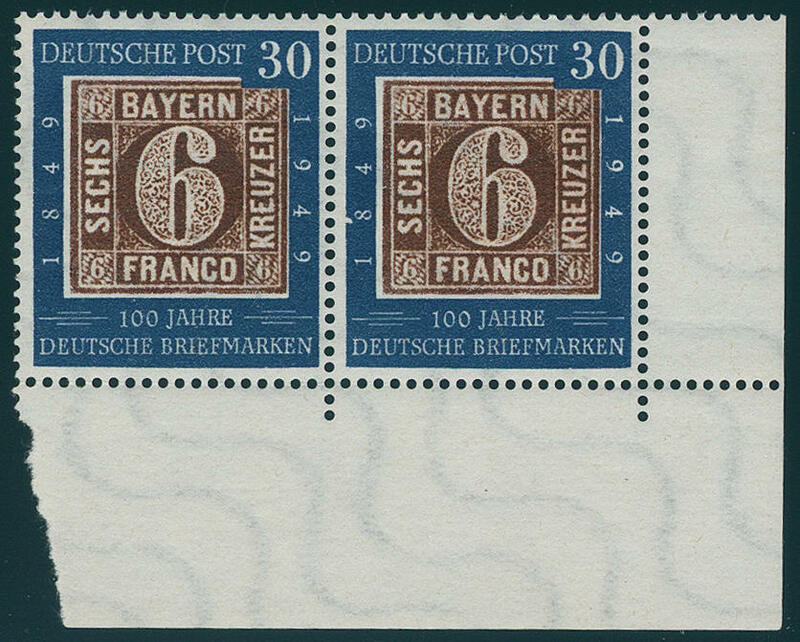 Lower House of German Parliament 1949 in the horizontal strip of three with very decorative oblique passing double perforation in the lower margin, fresh colors and in perfect condition mint never hinged in this kind an all extraordinary and scarce variety! Expertized Schlegel BPP. 6792 ✉ 112 20 Pfg. 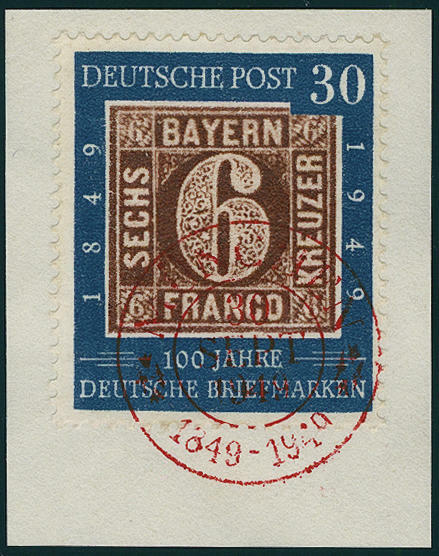 Lower House of German Parliament as a single franking on local letter the 2. Weight step from \"is worth 10.9.49. \". In lieu of of the sender adress addressee name was in each case a photo on the cover affixed. In this kind an all extraordinary and delightful document! 6793 112Abart 20 Pfg. 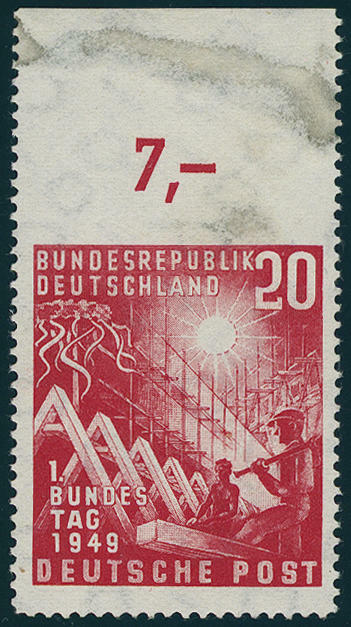 Lower House of German Parliament 1949, left lower corner of the sheet, as well the left vertical perforation row distinctive to the right shifted, unfolded, in perfect condition mint never hinged, without any signs. 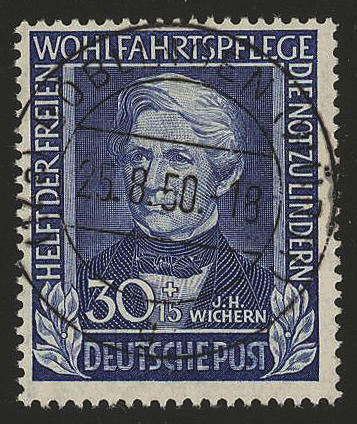 A decorative and scarce defective or badly placed perforation! 6794 / 112Uo 20 Pfg. Lower House of German Parliament 1949 from upper margin above unperforated, nearly mint never hinged, in the upper margin stuck. A scarce variety! 6795 113/15 100 years stamps 1949, block of four set from upper margin, fresh colors and very well perforated, unfolded, in perfect condition mint never hinged, photo expertize \"the quality is perfect\" Hans-Dieter Schlegel BPP. 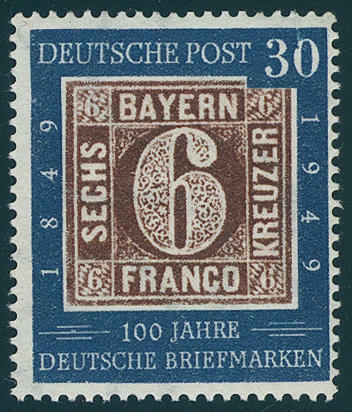 6796 ∆ 113/15 100 years stamps 1949 on lovely white letter pieces, single perfect used with red special cancel \"Munich 30. SEPT. 49\". An outstanding set, expertized Schlegel BPP. 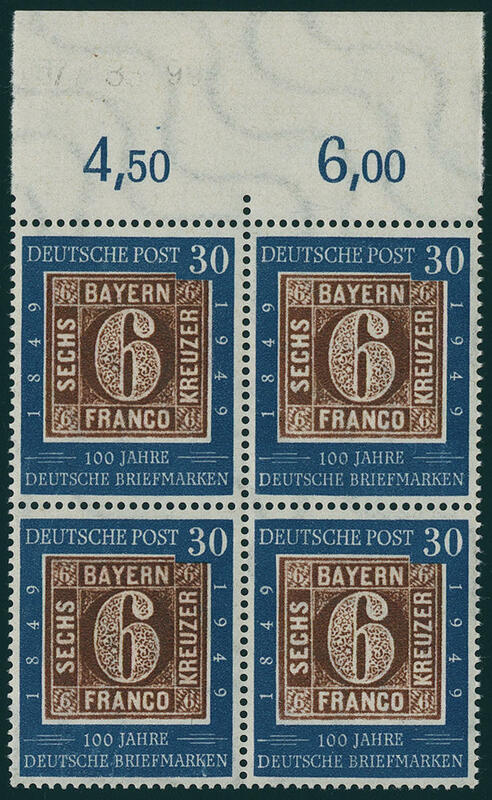 6797 113/15II 100 years stamps 1949 in horizontal corner margin pairs lower right, as well the 30 Pfg. With good plate flaw \"white notch at the left picture edge over 8 from 1849\", unfolded, in perfect condition mint never hinged, key value with photo expertize Schlegel BPP. Michel 500,- €. 6798 113Essay 10 Pfg. 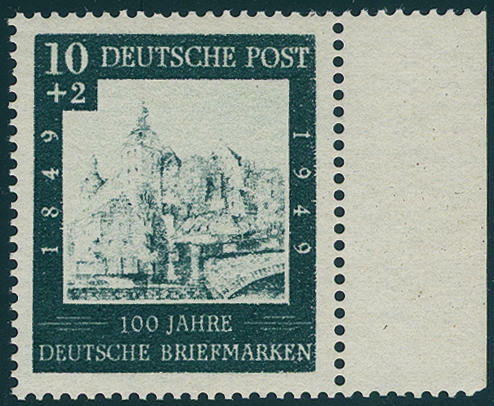 100 years stamps 1949, trial printing with indication of value left in lieu of right and centerpiece with city view, in perfect condition mint never hinged, from right margin of sheet, expertized Schlegel BPP. 6799 113III 10 Pfg. 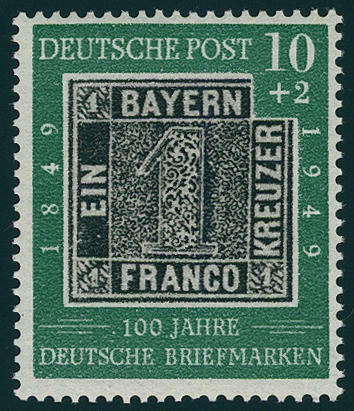 A hundred years stamps 1949 with good plate flaw \"retouching from plate flaw I\", fresh colors and in perfect condition mint never hinged, expertized Schlegel BPP. Michel 250,- €. 6800 113X 10 Pfg. 100 years stamps 1949 with very rare variety \"being absent watermark\", fresh colors and very well perforated, in perfect condition mint never hinged, without any signs. A varieties rarity and by Michel clearly undervalued! 6801 115I 30 Pfg. 100 years stamps 1949 with plate flaw I, in perfect condition mint never hinged, without any signs. Michel 350,- €. 6802 115VI 30 Pfg. 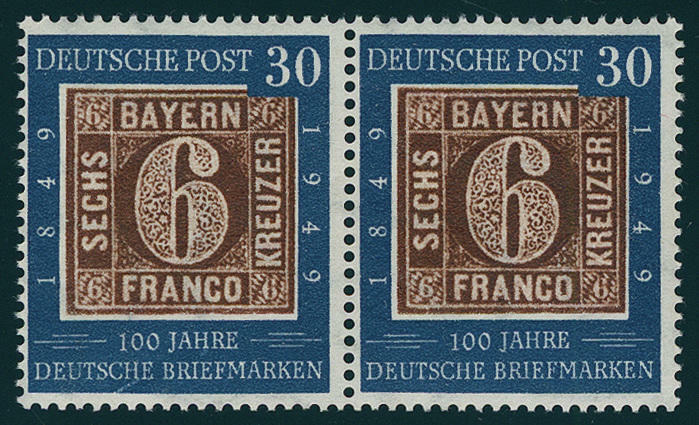 100 years stamps with plate flaw \"white oblique under CH in the lower German\" in the horizontal pair with normal stamp se-tenant, unfolded, in perfect condition mint never hinged, without signs. Michel 250,- €. 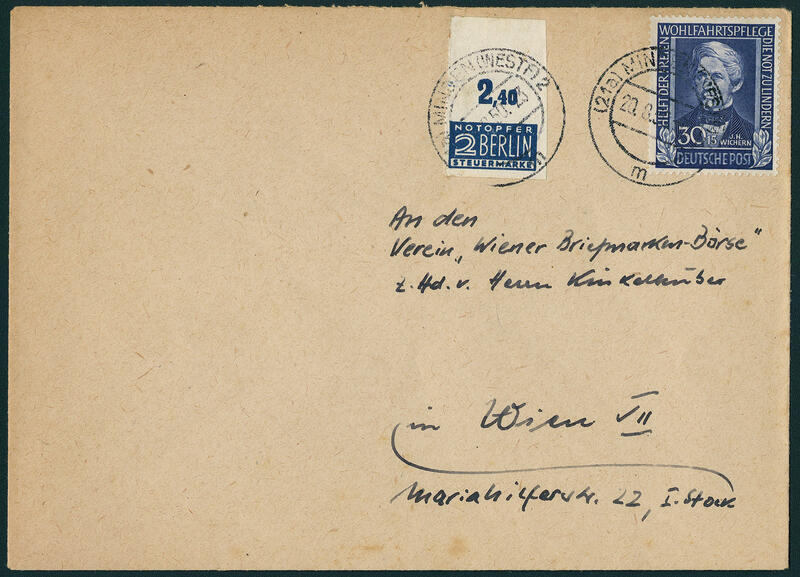 6803 ✉ 117/20 Welfare 1949 with additional franking American/British Zone on air mail letter from \"WETZLAR 23.2.51. 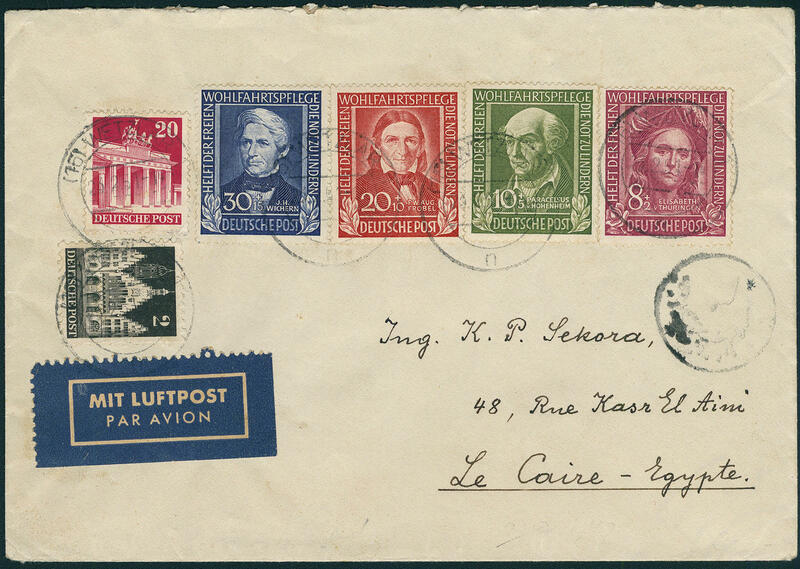 \" to Cairo / Egypt with arrival postmark. Scarce destination! 6804 FDC 116 30 Pfg. 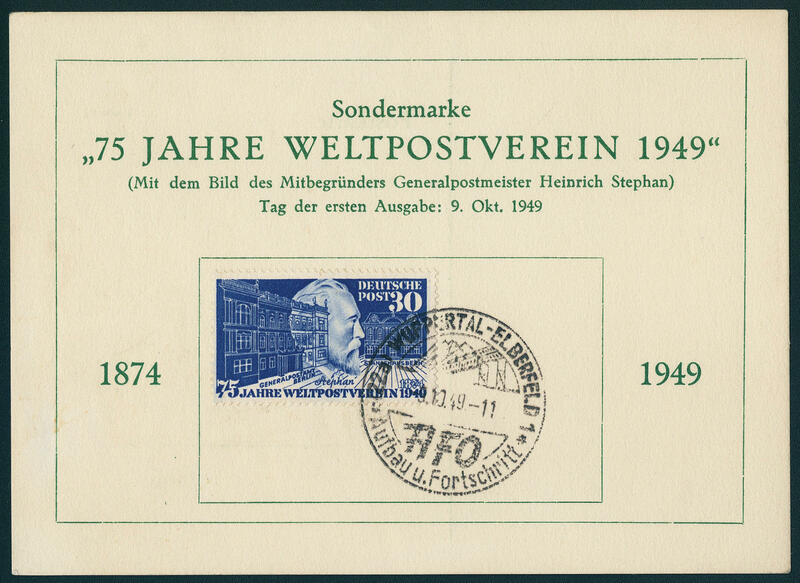 Stephan 1949 on very nice, faultless First day card with first day special cancel \"WUPPERTAL-ELBERFELD 9.10.49. \", very decorative and rare, photo expertise Schlegel BPP. 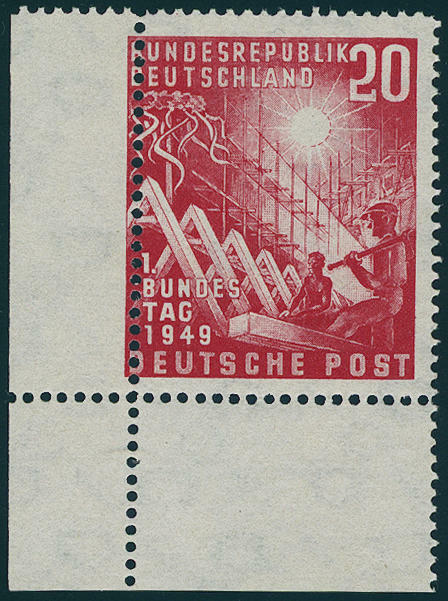 6805 ⊙ 117/20 Welfare 1949, in perfect condition and perfect centric cancellation, key value expertized Schlegel BPP. 6806 FDC 117/20 Welfare 1949, fresh colors and in perfect condition on gef. Postcard with day before the first day special cancel \"DÜSSELDORF Christmas fair 13.12.49. \". 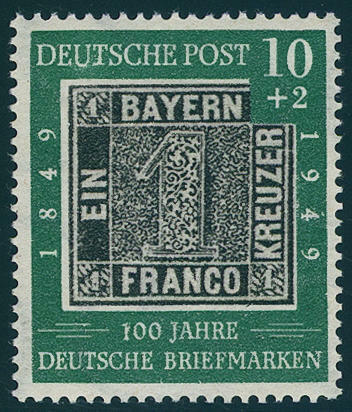 The first day of this issue was the 14.12.49, however were the stamps partial already in mid afternoon of the 13.12. Sold. Documents from day before the first day are extremely rare, we can a such document for the first time offer! Photo expertize Schlegel BPP. 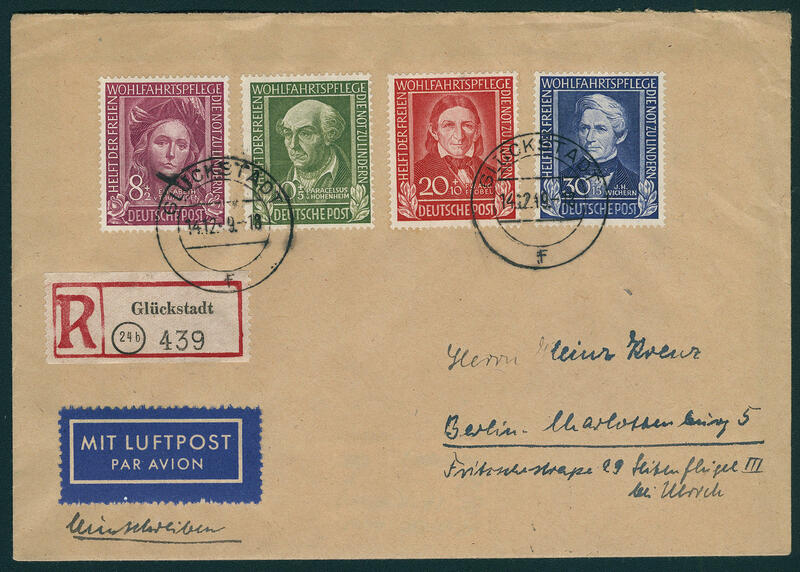 6807 FDC 117/20 Welfare 1949, faultless set on very nice First Day Cover per registered airmail from \"GLÜCKSTADT 14.12.49\" to Berlin-Charlottenburg with arrival postmark. First-Day-Covers of this issue are very rare! 6808 ✉ 120 30 Pfg. 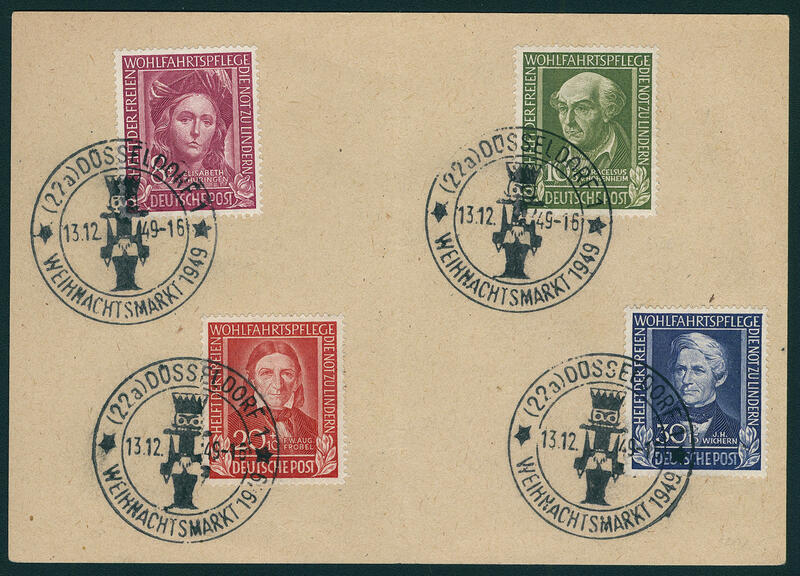 Welfare 1949, in perfect condition as correctly franked single franking on cover from \"MINDEN 20.8.50. \" to Vienna / Austria. Rare!